CHICAGO — Whether it's in post-genocide Rwanda or Chicago's South and West sides, Priya Shah loves introducing art to children. The Noble Square resident is director of the nonprofit "The Simple Good," which since 2012 has introduced eight-week afterschool art programs in about 25 of the city's underserved public and charter elementary and high schools. Shah's organization also recently teamed with nonprofit "Heart of a Thousand Hills" to launch "A Building Hope Project" that is in the process of erecting a school in Rwesero, Rwanda. The school is now open to first- and second-graders, with third- and fourth-grade classrooms getting built next year. 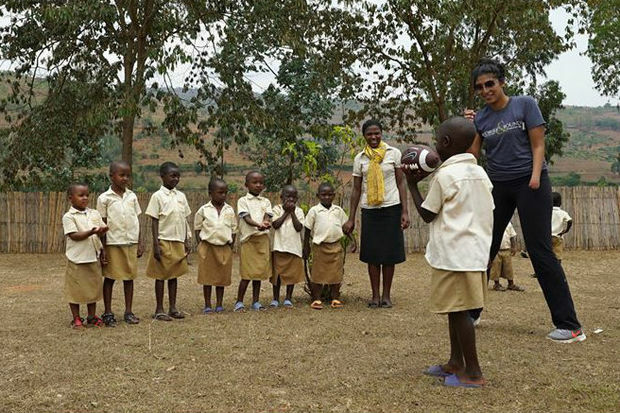 Building a school in Africa, Priya Shah shows students how to play football. Shah visited Africa this year to lead an art program for the African students, who at the completion made a mural that read "Love & Unity." "Art is not a common practice in Rwanda," said Shah, an Oak Park native and University of Illinois graduate. "Arts as a means of expression is limited in Rwanda and we have seen the same parallels in limited art programming in our work in the South and West Sides of Chicago. It was really powerful to see the students touch paint for the first time. It was really beautiful." Shah's organization focuses on a variety of arts for the classes, including photography, painting and collages. The afterschool programs conclude with a final public presentation at venues like Northwestern University and the Google main offices. Shah said the art students almost always begin to look at the world differently as they reach the end of the classes. It coincides with the program's goal to empower young people to "become positive activists in their community through art and discussion," Shah said. "We see a change in behavior, and they become more confident and change for the positive," she said. Shah said a film on the Rwandan project could be released in January. The post-genocide country, where more than 800,000 people were slaughtered in about 100 days in 1994, has a population where about 40 percent are less than 16 years old, so Shah said even the teachers were experiencing art for the first time. "It puts things in perspective," Shah said. For more information the fundraising campaign, click here.